In this paper we present a new technique for the display of High Dynamic Range (HDR) images on Low Dynamic Range (LDR) displays. The described process has three stages. First, the input image is segmented into luminance zones. 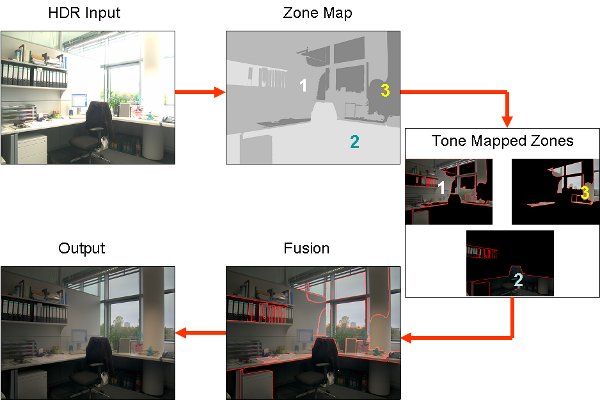 Second, the tone mapping operator (TMO) that performs better in each zone is automatically selected. Finally, the resulting tone mapping (TM) outputs for each zone are merged, generating the final LDR output image. To establish the TMO that performs better in each luminance zone we conducted a preliminary psychophysical experiment using a set of HDR images and six different TMOs. We validated our composite technique on several (new) HDR images and conducted a further psychophysical experiment, using an HDR display as reference, that establishes the advantages of our hybrid three-stage approach over a traditional individual TMO.